Summer hit early and hit with a vengeance. While Frederick and I just love baking together, we do not especially enjoy working in steaming hot kitchen. Frederick can handle the heat a bit longer than I can…but we are a team! We are finding that an increased amount of our kitchen time is spent experimenting with cold desserts. Popsicles are so easy to do with children. To make the process easier, you can make the pops with very small amounts of ingredient. Take for instance our blueberry-apricot creation. Alastair had eaten the better part of a container of blueberries, leaving the small, uninteresting ones. We also had several dead-ripe little apricots from a local tree. The fruit was not pretty, but it was bursting with flavor. Given another day in the kitchen, both the berries and the apricots could have ended up as chicken food. Not to worry! Frederick and I transformed this over-ripe fruit into one of the best treats of the summer. So simple! So scrumptious! Whirl the apricots in a blender until smooth. Add the cream and whirl some more. Taste for sweetness. Add a bit of honey if you like a sweeter popsicle. Use a delicately flavored honey that will not overwhelm the fruit flavors. Add the almond extract and taste. You may want a few more drops of flavoring. Careful! You can easily over-do this one. 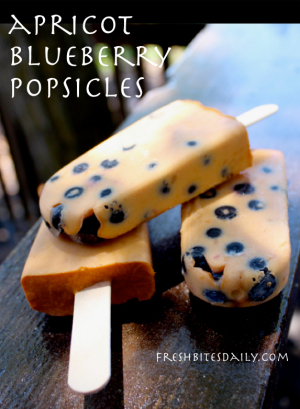 Divide the blueberries between four popsicle molds. Pour the apricot mixture over the berries. 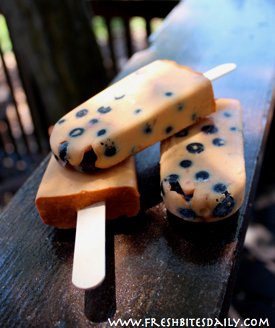 Gently tap each popsicle form on a hard surface to work the apricot mixture down through the berries. Insert popsicle sticks and place the forms in the freezer for several hours. Prepare to be delighted and amazed. We have served these as dessert to company who were totally charmed by the flavors.